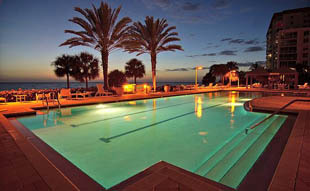 Situated just off Sarasota, Florida is the barrier island haven of Lido Key. Blessed with gorgeous beaches, this small island also boasts stunning condos, wonderful homes, and close proximity to the luxurious shopping mecca of St. Armands Circle. The other arts, cultural, and entertainment venues of the downtown Sarasota area are about 5 minutes over the Ringling Bridge which connects 4 of Sarasota’s barrier islands to the city center. The idyllic Florida lifestyle is very easy to discover and enjoy on Lido Key. If you are you a boater, golfer, or tennis player the venues to enjoy these pursuits are, again, about 10 minutes away from any condo development on Lido Key. If living on the beach is the dream of a lifetime, then the fabulous beachfront condo community of L’ Elegance is the dream come true. 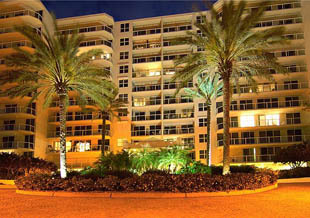 Constructed in 1996, it’s nestled on the south end of Lido Key and features 105 gorgeous residences. The condo designs of the 1990’s entailed expansive windows, large terraces, and high ceilings and L’ Elegance employed these treatments and a lot more. With its position on the beach, the large windows allow far reaching panoramic vistas of the Gulf of Mexico. 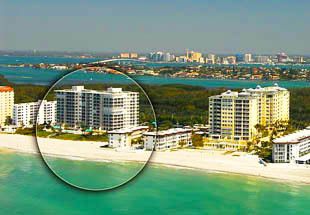 Other vantage points provide sweeping views of Sarasota Bay, and the City of Sarasota’s downtown skyline. L’Elegance offers resort type facilities that include an 85ft lap lane swimming pool and spa with bay views, 2 Har-Tru tennis courts, along with a cutting edge fitness area and dry saunas. Other welcomed features include high speed wireless internet access throughout the property’s common areas, 24/7 security guard service, and lower level assigned parking. A beach front condo for sale at L’Elegance, along with being a charming place to live, is also an outstanding investment. The main reason for this is that once property on the beach is developed, there will certainly be no more beach front locations created, especially as breathtaking as this one. Because of their beauty and the location and position of the building, those on the hunt for Lido Key real estate for sale inquire about the condos at L’ Elegance when they drive through the island. There are 2 and 3 bedroom condos for sale at L’ Elegance with floor plans of 1,350 to 2,230 square feet. Prices generally range from around the high $800,000 to the $1,850,000 range depending on location in the complex, size, design treatments, and appointments. L’ Elegance is also within close proximity to the Ringling Museum of Art, Van Wezel Performing Arts Hall, and Golden Dinner Apple Theater for those who appreciate a live performance. The Selby County Library, Ringling College of Art and Design, and the Sarasota Convention and Visitors Bureau are very close by. Also 4 miles away from L’ Elegance, the Sarasota/Bradenton International Airport is convenient and easy to navigate in and out of. Below are all of the current real estate listings available for sale at L’ Elegance.